Some of my readers and friends who I keep in touch with on another level besides the comment section of the blog know about a little project that I was trying to get off the ground about a year ago. The project was the cleanup and restoration of a marsh area located near the Rocky Point Yacht Club or Silver Yacht Club, in Breezy Point Queens NY. My interest in this area peaked in the summer of 2009, when I documented and photographed some birds that were lurking around the area. I wondered then, if cleaning up the area and making it more bird friendly would bring in more species. In addition, the area was down right filthy and left me wondering what the heck had previous volunteer missions accomplished in past cleanups. 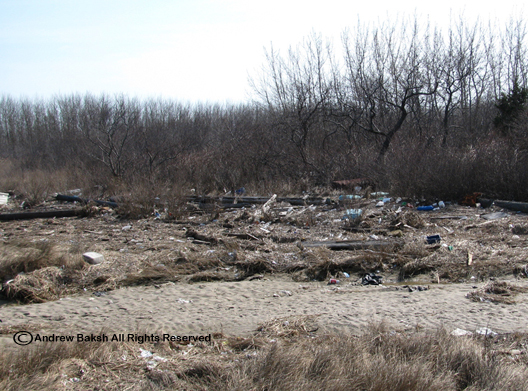 It was apparent that cleanups focused more on the beach front rather than the marsh area. I began having discussions with veteran National Park Service VIP Tony Luscombe, whom I had met through the Piping Plover program at Breezy Point in Queens and we began exchanging ideas and e-mails on what could be done. 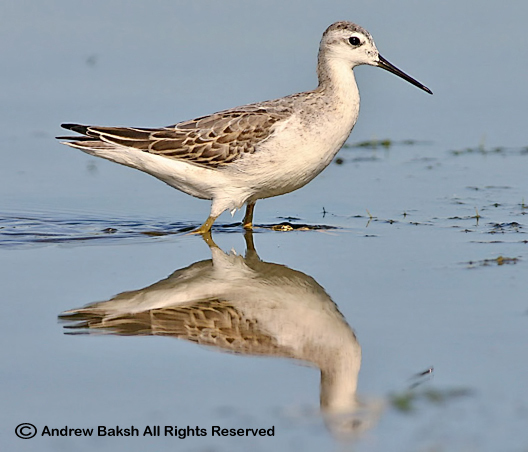 Around the same time, Don Riepe of the American Littoral Society had begun toying with the idea of creating a group to bring pressure on NPS with regards to Jamaica Bay Wildlife Refuge and its upkeep. 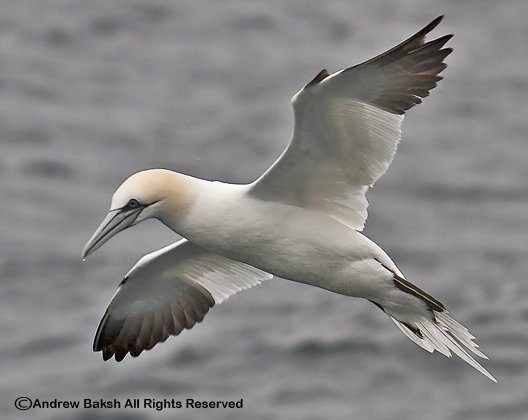 I challenged Don to get involved with this project in order to establish the legitimacy of his new group as well as the American Littoral Society as Coastal Guardians. Don warmed up to the idea, but expressed concern on managing a sizable group and how to get debris out of the marsh area. 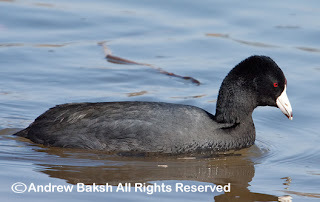 In the meantime, Tony had garnered the interest of volunteers who spearheaded by volunteer Shervin Hess began a process of cleaning the marsh whenever time permitted. 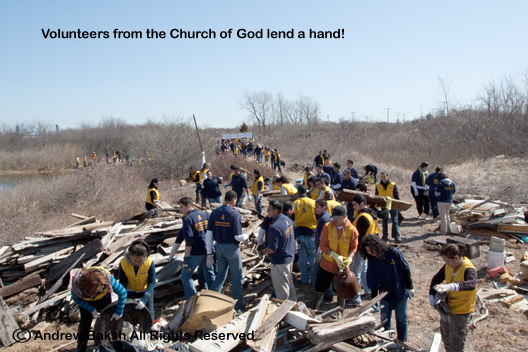 Volunteers from the Church of God cleaning up the marsh. On the week of Marsh 20th, I received word from Don that he was going to have available, a massive volunteer core, courtesy of the Church of God to help in cleaning up the marsh and asked for my assistance in leading the effort. 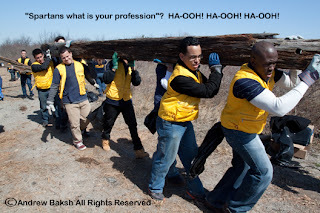 I was ecstatic and offered to assist in whatever capacity I could. I remembered the group from a previous cleanup project at Plum Beach in Brooklyn and the impression they left with me was of a passionate group of people who gave it their all when they came out on that particular project. March 20th came and the wave of volunteers showed up, over 300 hundred of them. So many, that Don diverted about 100 of them to Plum Beach to do some cleaning up in that area as well. 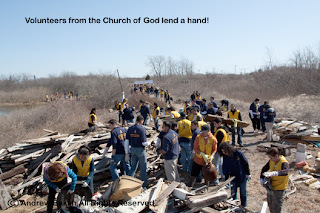 It was astonishing to witness the passion and energy that these church goers brought with them in cleaning up the marsh. The word of the day was "unity"! With cries of "Spartans what is your profession"? HA-OOH! HA-OOH! HA-OOH! and giving praise to Jesus, the teams of volunteers worked together in removing massive beams, raking up garbage, and piling up mounds of wood, all in a matter of hours. The word of the day was "Unity", it was AWESOME!! Participating with these volunteers, I felt their wave of energy that seemed to engulf the area and I could not help but wish I had more birders/naturalists out in the field with us that day. I was very pleased to see that this project had finally received the much needed help it required. Too often, projects like this get caught up in bureaucracy and hubris with groups and individuals more concerned with accolades and the rule book rather than the greater good. Tony Luscombe, deserves a lot of credit for continuing to work behind the scenes in getting initiatives like this to take root and I hope that the folks at the National Park Service, find a way to recognize his efforts. What is next for this area? Well, NPS Gateway National Recreation Area needs to formulate a plan to prevent debris from being washed into the marsh or else all this work would have been in vain if a nasty nor'easter hits the area. There is plenty to be done here and in many other areas that need attention. 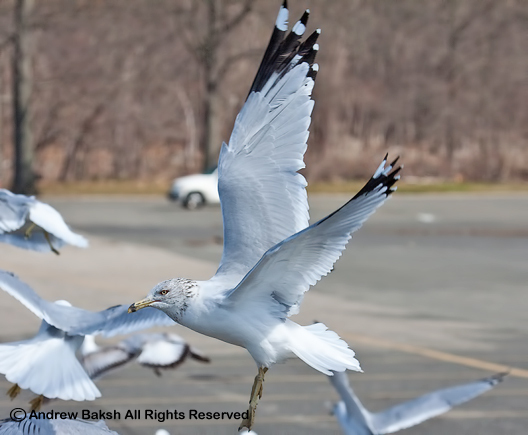 In fact I have another project that I am setting my sights on, so keep checking back to learn more and if you could spare the time, then come out and join us when we cleanup around the Jamaica Bay area. Just drop me an e-mail and I will add you to the mailing list. Let me once again thank the volunteers from the Church of God who came out and put in a solid couple of hours in cleaning up the area and I hope to see you all on future projects. Additional photos from the event can be seen here. 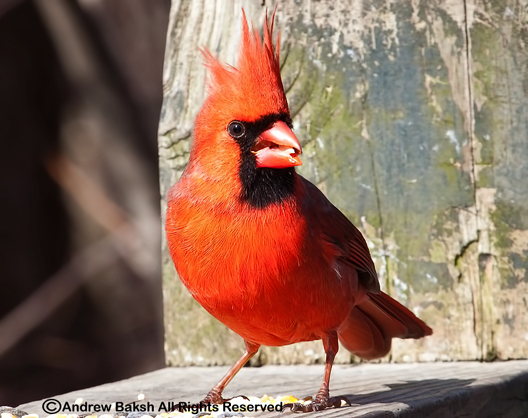 Last Saturday was one of our slowest days since we began the Van Courtlandt bird walk. After meeting the group we worked the parade grounds, picking up a few Killdeers (Charadrius vociferus) loafing around in the field with American Crows (Corvus brachyrhynchos) lurking nearby. For a few new attendees, these were life birds and like I always do with someone's life bird, I made sure they took some time out to get good looks. We then headed around the lake for our walk. Land birds and waterfowl were scarce and try as I might to search and listen for any early migrants, it did not pan out. We did pickup Hooded Mergansers (Lophodytes cucullatus), Wood Duck (Aix sponsa) and a pair of Green-winged Teals (Anas crecca) on the lake. That, coupled with the now familiar sight of the lone American Coot (Fulica americana) were the highlights of our walk. I did take the group up Vault Hill where we poked around many of the small meadows in the hope for land birds. We did manage to pick up some birds here and there, but all in all it was very quiet. It is on days like these that I like to take the time to enjoy our more common species. We took the time out to enjoy the American Robins (Turdus migratorius) whose numbers were definitely on the rise with well over 60+ in one area of our hike. Despite the lack of birds, our group remained upbeat enjoying the hike and it was good to see their spirits high. It is still early, but I am hoping that we see things picking up within the next week or so. This week the Urban Park Rangers will be leading the walk, but I will be back the following week. Here is a list of the species seen. 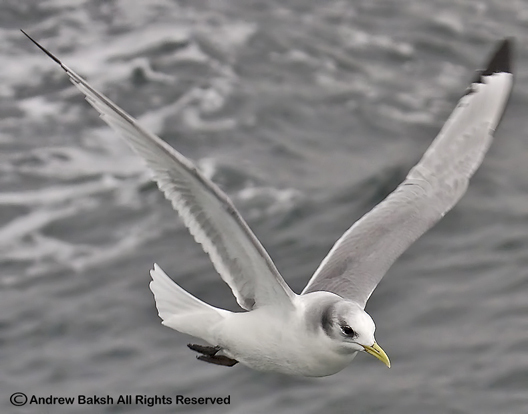 Last year, I had outstanding looks at many birds during my first Pelagic out of New York. Tomorrow, I venture out again this time a little later in the year, so I am not sure what I will see, but I if I get looks at birds like the following images, I will be pretty stoked! 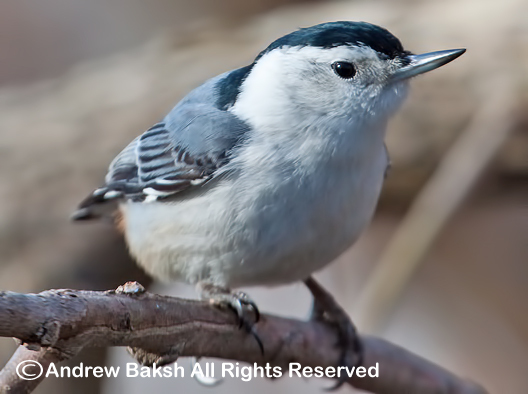 We continue to pickup some nice birds on our Van Courtlandt Bird Walk. Last Saturday, our group met for our bird walk, at our usual spot, the Nature Center across from the parade grounds at Van Courtlandt Park. I had gotten to the park very early to do a little scouting and my early vigil near the fields picked up 2 goodies, which I managed to get most of our group on, once they arrived. 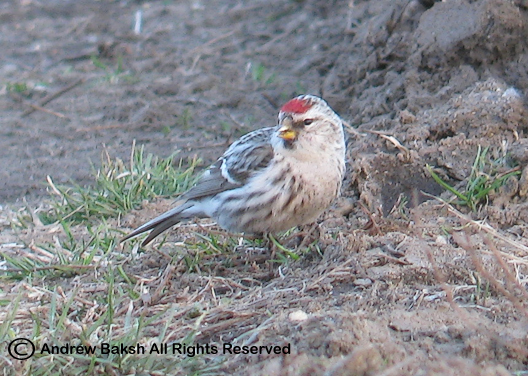 A first time for the walk, Common Redpoll (Acanthis flammea) and an American Pipit (Anthus rubescens). Both birds, did not stick around for long and those of us who got on the birds felt very lucky that we were able to get good looks. Instead of the VC lake trail, I changed up the routine to take us into the North Woods in search of possible early migrants. While we did have much luck in the woods, we enjoyed the walk. On our way back to the nature center, I steered the group towards the meadows near Vault Hill to look for Eastern Bluebirds (Sialia sialis). Reports of migrating Bluebirds being reported had my hopes up and the move paid off thanks to Ranger Deli. Deli, who was out and about birding in the Meadows near Vault Hill had spotted an Eastern Bluebird just before we arrived to the location. Deli, re-found the bird and we all got good looks of the Bluebird, which was another new bird for our walk. 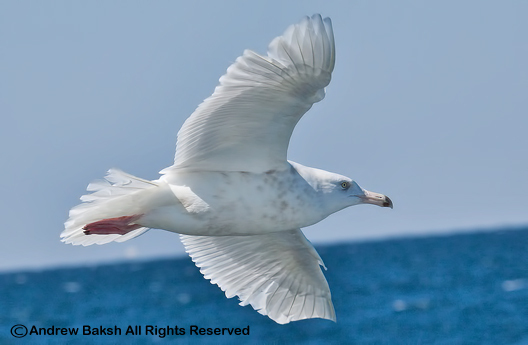 A complete list of the species seen, is provided below. John Beetham from "A DC Birding Blog" and fellow Bloggerhead Kingbird, was the only person to get all of the species correctly. 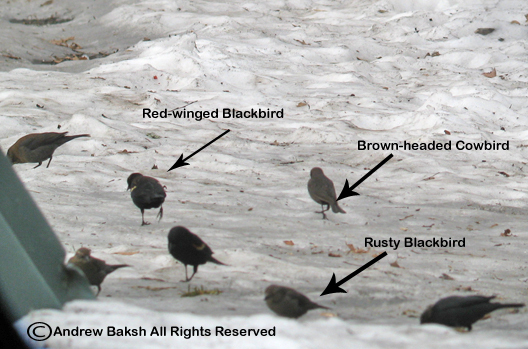 I have provided an enlarged photo (see below) labeling some of the birds. Note, that I did not label every bird because I am hoping that folks would take a shot at figuring out which label would apply to the remaining non labeled birds in the photo. 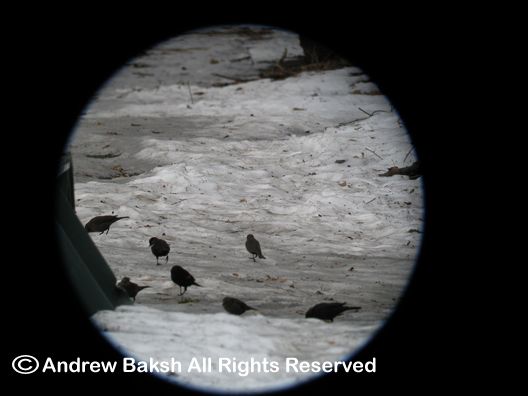 I hope to see many more entries from my Van Courtlandt Bird Walk attendees and on that note, would like to thank Frank Donovan for his good effort. Richardson Cackling Goose amongst the flock of Canada Geese. Last Saturday, our group met for our Van Courtlandt Bird Walk, at our usual spot, the Nature Center across from the parade grounds at Van Courtlandt Park. 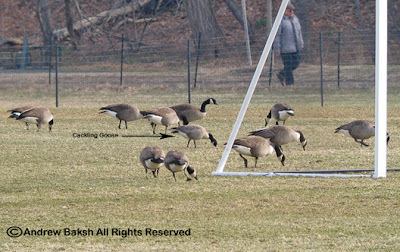 Before heading out for the Van Courtlandt Lake trail, I scanned the parade ground fields and found a treat amongst the flock of Canada Geese (Branta canadensis). A Richardson Cackling Goose (Branta hutchinsii hutchinsii); it was pretty far out, so I convinced the group that it was worth walking over to the Broadway side of the parade grounds to get a better look. We all got very good looks and I was especially pleased at finding this bird since it was a lifer for all of the folks in attendance. Memories of my friends Patricia Lindsay and Shai Mitra putting on a clinic in picking out Cackling Geese in Orange County, a week ago still lingered and I was glad to be able to pick out one for my walk. From the Parade grounds we hiked around the lake looking for lingering waterfowl and possibly early migrants. 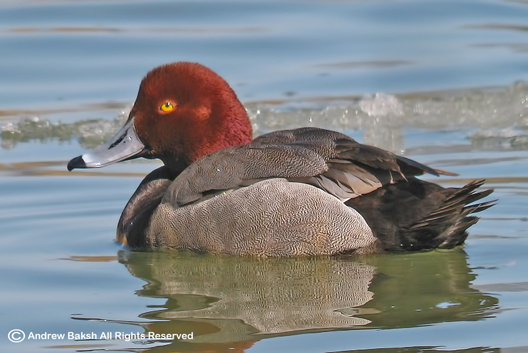 It was slow birding until we reached the golf course where we picked up many of our usual species. We ended our walk with 32 species with our best bird being the Cackling Goose. This makes the 2nd rare Goose we have recorded on this walk, with the other being a Greater White-fronted Goose (Anser albifrons)that we had last December. A complete list of species from our walk is provided below. If you are a regular reader of this blog, you might have learned about my Piping Plover volunteer duties at Breezy Point Queens NY and read the post of banded Piping Plovers that I photographed there last summer. The exciting aspect of the post was that the Plovers were banded in the Bahamas. 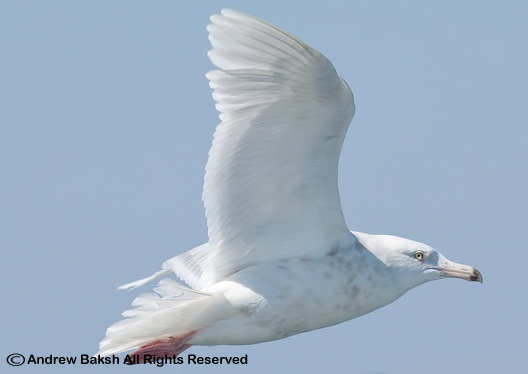 Documenting them at Breezy Point in Queens NY meant that they had successfully made it to the coast during migration. 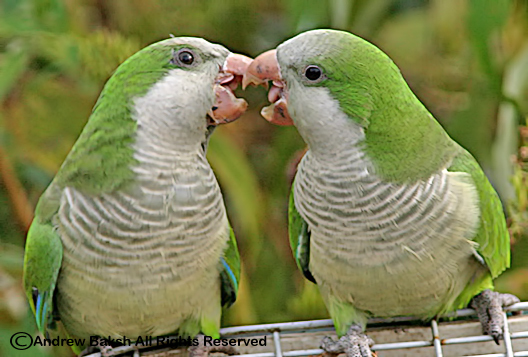 Throughout this winter, I had hoped to hear if any of the birds were seen back in the Bahamas. Imagine my excitement when I received an e-mail from Peter Doherty (one of the banders) on March 1st, informing me that one of the Piping Plover's that I had photographed at Breezy Point was seen and photographed in the Bahamas on February 23rd 2011. 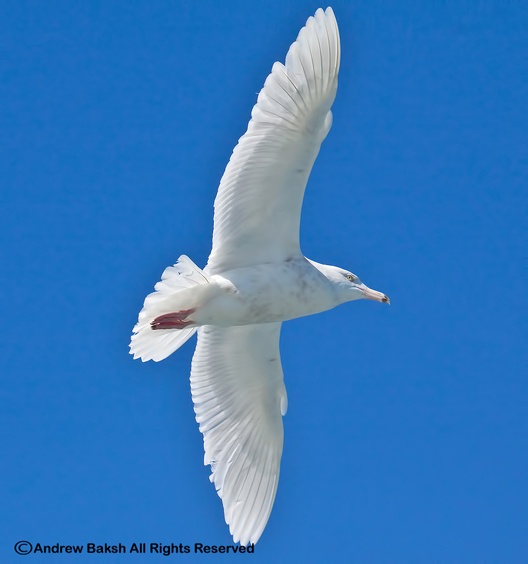 The bird was seen and photographed by David Jones off North Andros Island of The Bahamas. 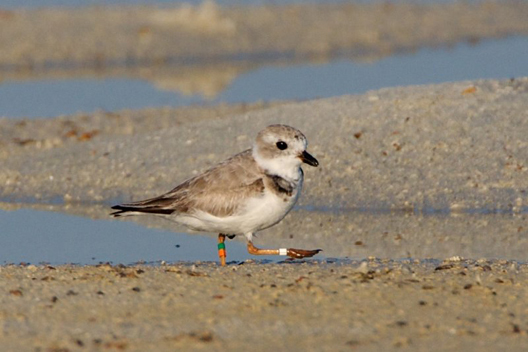 David has photographed other banded Piping Plovers at the same location, which could be seen at his Pbase site. Now, the watch begins to see if any of these Piping Plovers make it back to the coast. Banded Piping Plover photographed in the Bahamas by David Jones All Rights Reserved. 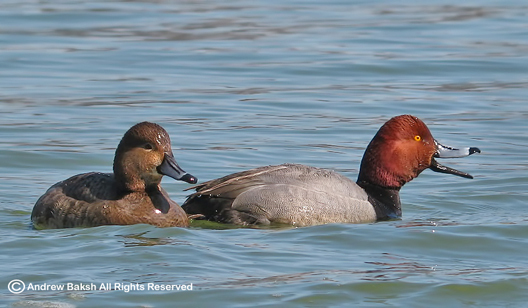 Take a crack at counting and then identify the species in today's photo quiz. I'll post the submissions and an enlarged image to discuss the identities next Tuesday. Good luck! 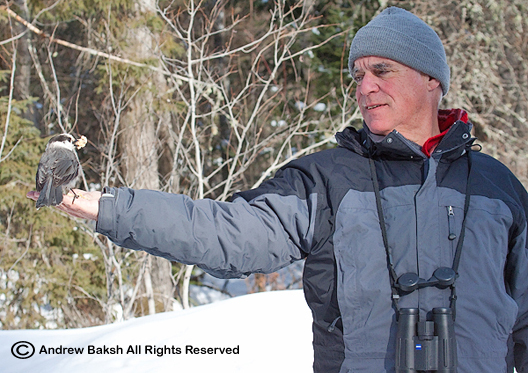 Adirondack Birding - Saving the Best for Last! Gray Jay eating food from Joe's hand. 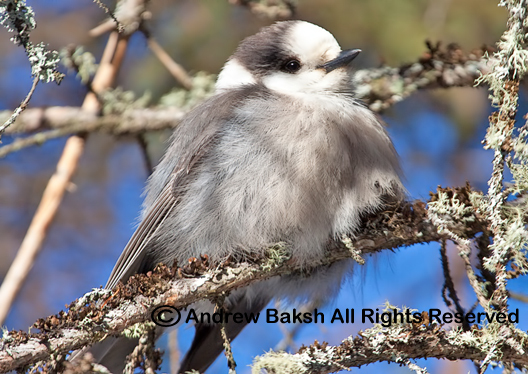 The next day we returned to the area where Joe had the Gray Jay (Perisoreus canadensis). We had walked in a few yards when I turned around and spotted a Gray Jay flying in behind us. I quickly took out some birds seeds and threw it on the ground. In a matter of minutes we had 4-5 Gray Jays coming in. 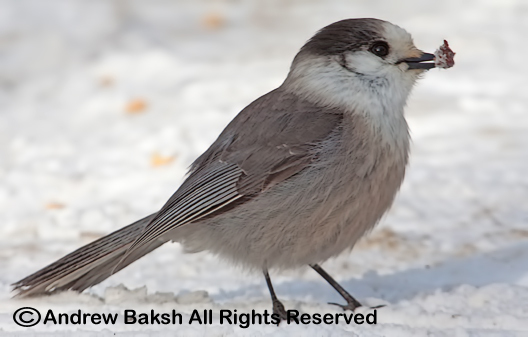 I gave Joe some seeds and a curious Gray Jay came right in and took some from his hand. We were stoked!!! We headed back out to try the other side of the trail for Boreal Chickadees and I put out more food. 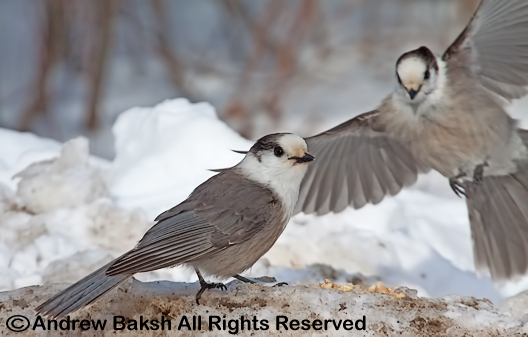 Eventually, we had at least 10-12 Gray Jays coming in to get the food. Joe and I took turns holding food in our hands and had Jays eating out our hands. It was the coolest thing!!! The Gray Jay was a life bird for me, so I soaked up the views. Joe by then had started to look for Boreal Chickadees (Poecile hudsonicus) and had walked in a little on the other side of the trail when he yelled, “Boreal Chickadee”…I hurried over and got my bins up in time to see 2 Boreal Chickadees flying in to see what the Jays were fussing over. We were estatic!!!! 2 more target birds picked up in matter of minutes, we were on a hot streak! I looked over at Joe and said to him, “seeing as how we are riding this hot streak, how about we try again for better looks at the Bohemian Waxwings” (Bombycilla garrulus). Joe was in agreement so we headed out to try once again for the Bohemians. 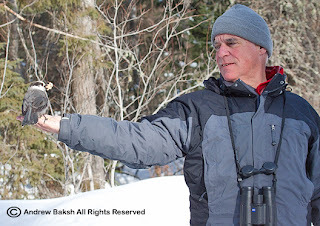 On our way, we made one stop to try another area for Black-backed Woodpecker (Picoides arcticus), which we did not get but we did get to see 2 more Boreal Chickadees. We arrived at the area where the Bohemian Waxings were seen on day 1 of our trip and in a matter of minutes, Joe had the birds. I got my scope out and soaked in the birds. I watched them flying in and out over the tree line and suggested that we walk back up the hill to get a better look. I had a hunch that there were birds perched or moving around nearer the ground around the tree line that offered better looks. 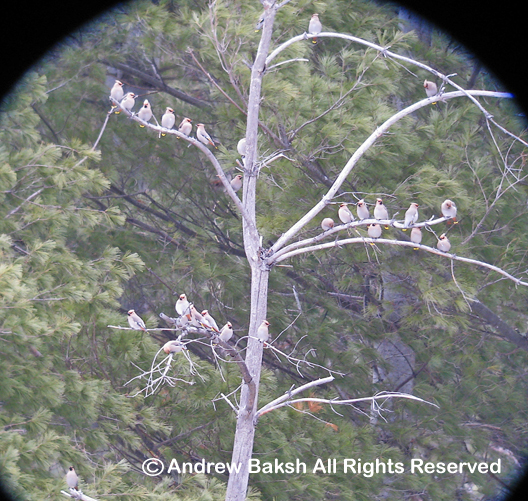 The gamble paid off, as soon as I was half way up the hill I picked out Bohemian Waxwings perched on a tree. I quickly waved Joe on and had the birds in the scope for him to view once he got to where I was. In watching the birds, swoop around the bushes, I wondered if we would get lucky with them coming in closer. Again the gods smiled on us as the Bohemian Waxwings began circling and coming in closer to us. I was so excited that I almost forgot that we were on a hill with incoming traffic. I was able to digiscope and photograph the birds and then we safely walked back down the hill and then on our way to Fort Edwards the last stop before heading home. 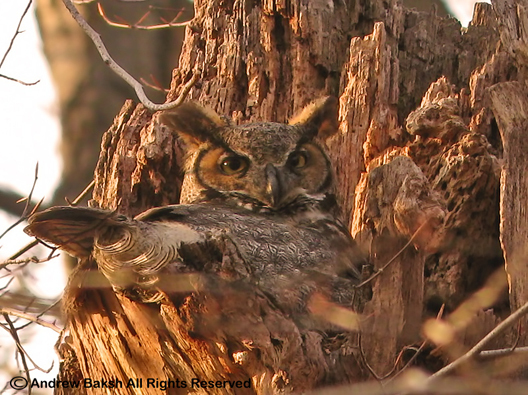 At Fort Edwards, we picked up several target birds, many of them for Joe as I already had these birds for the year. 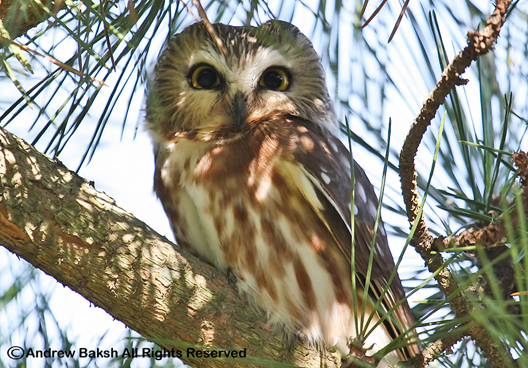 Rough-legged Hawks (Buteo lagopus) and Eastern Bluebirds (Sialia sialis) were easy, but the most difficult of the the 3 the Short-eared Owl (Asio flammeus) was not to be seen. We summed up our trip on the way home as a very successful one but wished we had a few more of our friends to share the moments with. Maybe next year? We started out very early the next day in -18 degree temperature. After a lousy cup of coffee, we birded Oregon Plains Road and Bigelow Road in Bloomingdale, NY. The area encompasses a bog and cedar woods with sedge marsh and coniferous woods, great habitat for boreal species. Unfortunately, we did not see much bird movement. 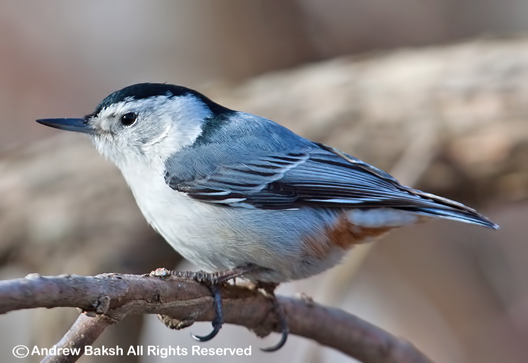 Pine Siskins, American Goldfinches and a few Black-capped Chickadees, were the only birds that moved around in the area. After a while we decided to head out to look for Evening Grosbeaks (Coccothraustes vespertinus) and possibly Hoary Redpoll (Acanthis hornemanni). We visited local feeders at a private residence in the area that we had intelligence on and we picked up both target birds! 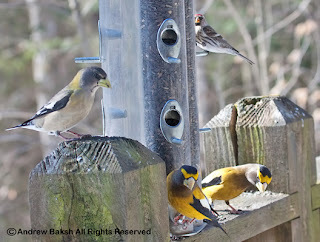 From the local feeders, we decided to try another set of feeders at the Newcomb VIC. We had success in seeing Evening Grosbeaks again along with lots of Common Redpolls (Acanthis flammea) and another Hoary Redpoll – though no Purple Finches (Carpodacus purpureus) or Pine Siskins (Carduelis pinus). Joe and I took some time to study the Redpolls and twice we picked out a Hoary Repoll at the feeders among the many Common Redpolls that kept pouring in. Rich and Rob who were on their way back to NYC, decided to try for Ruffed Grouse (Bonasa umbellus) a bird that Joe had at the VIC on a previous trip and so we joined them donning snow shoes to try the trails. Joe was hesitant and did not seem comfortable with the snow shoes, so after about 5 minutes into the trail, I offered to turn back much to his relief. We departed Newcomb biding Rich and Rob good luck in their Grouse search. Joe and I then tried an area that we were told was good for Boreal Chickadees, but the trail was inaccessible and so we abandoned that plan. 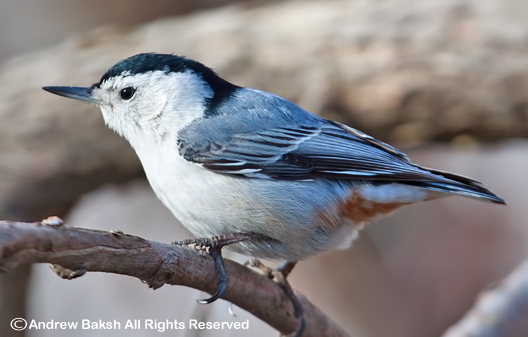 We headed back to Bigelow Road where we tried again for species like Boreal Chickadees (Poecile hudsonicus), Black-backed Woodpecker (Picoides arcticus) and Gray Jay (Perisoreus canadensis). Joe got a lone Gray Jay that flew in to check him out, but I missed getting satisfactory looks as I had walked on ahead on the trail trying to see if the guy I spotted feeding birds in the trail up ahead had Gray Jays. We called it a day soon after and over dinner made plans for our last day before heading home. Next up Day III - homeward bound.